As summer approaches my design mind begins to drift toward stitches that are light and airy. 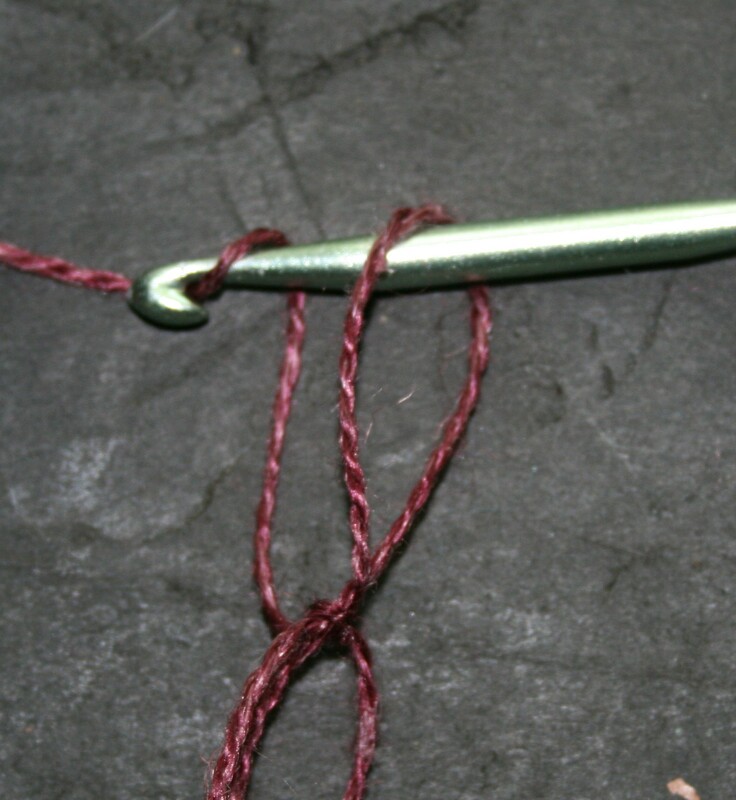 With the change of season coming upon my region I have found myself playing with a classic crochet stitch referred to as a Love Knot (it is also recognized as a Solomon Knot). This is a really airy stitch that highlights yarn in a very unique way. Yarn really has an opportunity to show its true nature be it springy or limp, squishy or firm, heavy or light. One of the things I really love about this stitch is how it really allows you to “stretch” the usage of the yarn, it is really easy to create an entire wrap (of a substantial size) with a mere 400 yards of light weight yarn. It feels like the yarn could go on forever. 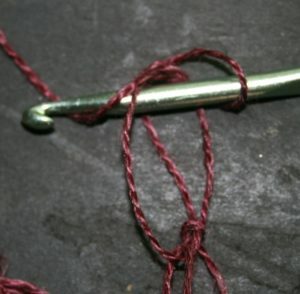 Working the stitch might at first seem a bit cumbersome, but really you are essentially securing loose chain stitches. To create a Love or Solomon’s Knot you simply pull a loop through the stitch you have just completed, pull it up to a height you feel comfortable with repeating, I find I usually pull up a loop of about 1” (2.5cm) in height. 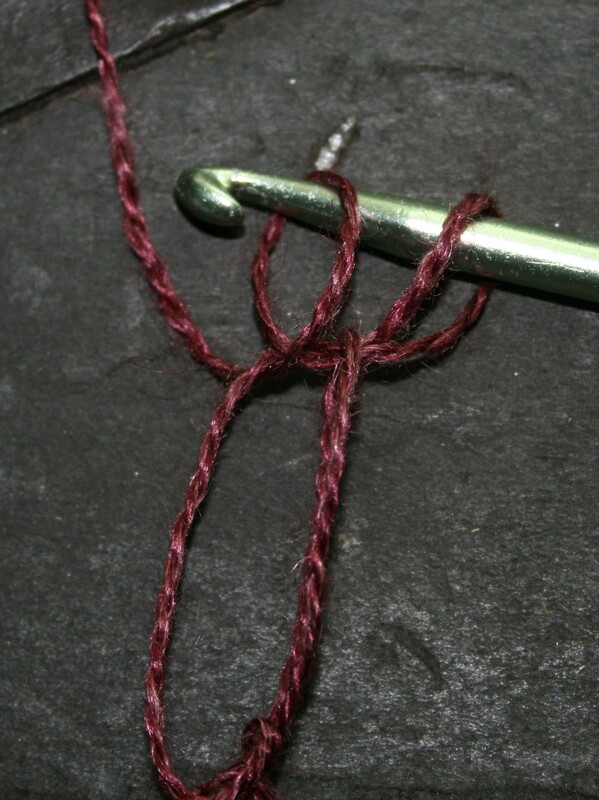 Now yarn over and pull through the loop, just as if creating a chain stitch, I try to pinch the base of the “pull through” so that I can distinguish the yarn being pulled through the loop. 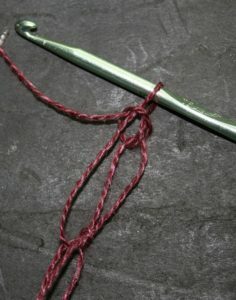 You then insert your hook between the “loop” and the “Pull Through”, yarn over and pull through a loop, you now have 2 loops on your hook. Yarn over and pull through both loops. 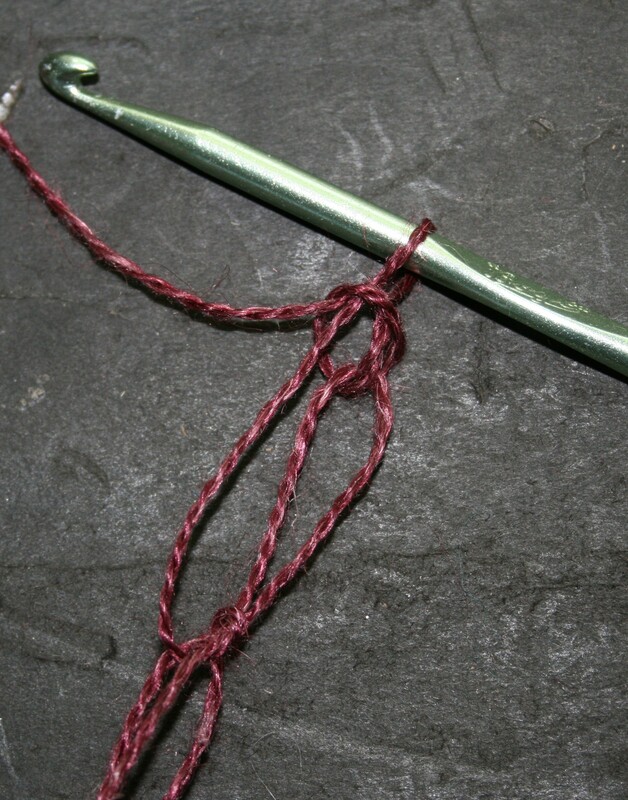 This process is essentially creating a single crochet (a double crochet in UK) in the space between the “loop” and “pull through” of the long chain. This completes the stitch. You repeat the process of these long chains with single crochets worked between the loop and pull through for as long as you want to work this stitch. 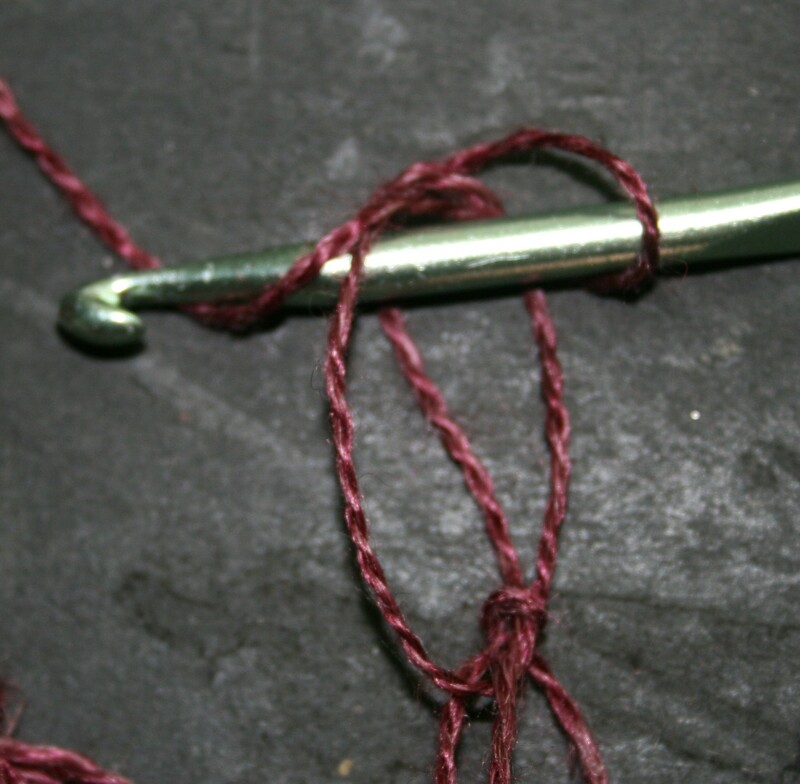 This process creates a long chain, so create a fabric you have to work these stitches over themselves. 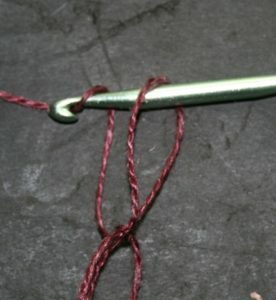 To work into a second row of the Love or Solomon Knot, after a knot is created, a stitch (a single (UK double) crochet is most common, but any stitch can really be worked) is then worked into the closing “single crochet” of another knot. Various patterns offer different approaches of when and what stitch to work into, but this is the basic process. I find myself playing with technique lately, hoping to share something with you soon. This entry was posted in Crochet Understanding, Encouragement, Stitch Patterns, website and tagged airy crochet fabric, Crochet, dean, Design, drape, ideas, inspiration, linda, Linda Dean, linda dean crochet, love knot, pattern, solomon knot, solomon's knot, stitch, Stitches, wrap, Yarn by webmaster. Bookmark the permalink.